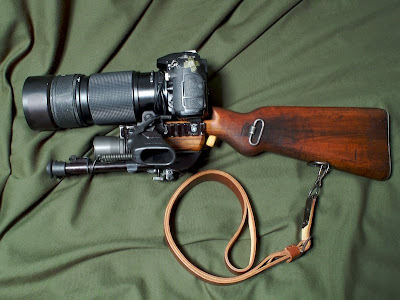 Let's say you are going "big game" hunting and you need your longest telephoto. Camera shake is the bane of telephoto photography, so anything that can steady your "shot" would be most welcome. Enter the Tactical Camera Assault Long Range Stock. Slap this accessory on your SLR and benefit from it's ergonomic bracing capability. It's not something you'll find in your local Ritz Camera store. Want to see it in action? Visit the official website at 230Grain.com.